802.11b/g/n 150Mbps Outdoor Wireless AP. High Power & Ultra Long-Range. ·Integrated design for shell, it can adapt bad working environments of outdoor. ·Employ directive antenna technology, up to150Mbps wireless transmission rate, farther transmission distance. ·Multiple encryption modes and strategy, wireless network is safer. ·Support PoE to provide power, user can flexible. Size: 266mm x 120mm x 83mm. Long-distance connection of wireless video monitoring network (police station, oil casing-pipes, security fire alarm system in forest, Sentries, factory and mine work, warehouse, plot, residential quarter and industrial park etc) - WLAN interconnection in enterprise - Unlimitedly extends WI-FI network - Cover wireless network in countryside when informatization is constructed. Note: Passive PoE is not the standard of PoE (802.3af), please use it with the corollary equipment. Excellent performance Complies with IEEE802.11n/g/b standards, employs the best chipset of Industry leading technology and built-in 12dBi high gain directive antenna, wireless transmission is farther, coverage is wider. Outdoor design Integration design for shell, it is dustproof, moisture proof, waterproof and anti-UV, can meet the request for all-weather work outdoor. Multi-working modes Provides multiple working modes such as wireless routing, wireless AP, AP client, wireless bridging and wireless repeater, no matter what the transmission is point-to-point or single point to multipoint, it can easily deal with. Multiple security system Support SSID hiding, MAC address filtering, 64/128/152-bit WEP encryption and WPA-PSK/WPA2-PSK, WPA/WPA2 security mechanism to protect your network not be violated and misappropriation. Rich and practical features Supports Passive PoE that supplies power by reticle, th rough this way, user get rid of the limit of power source thoroughly, and builds the position of AP freely. Supports wireless transmitting power with adjustable function, has external antenna, it easily control the coverage and transmitting directing to construct a network LED indicates signal intensity, it is convenient for you to setup network. Built-in one 12dBi high gain directive antenna. A port of 10/100M self-adaption LAN, support AUTO-MDIX, support Passive PoE; A RP-SMA for external antenna interface; A hole of GND. PWR power indicator;SYS system indicator;LAN Link/Act status indicator;Signal intensity indicator. Switch of SSID Broadcasting;Channel selection :1-14;Support multinational channels. Flitting MAC address;Turn on/of wireless security ; 64/128/152bit WEP encryption; WPA-PSK/WPA2-PSK. AP Router mode;AP mode;AP Client mode;AP Client Router mode;Bridge mode; Multi-Bridge/Repeater mode;Repeater mode;Wireless Router mode. Support wireless signal switch seamlessly;Provide Wireless host status indicator. DHCP Server;DHCP Client;Client list;static IP address assignment; binding IP address and MAC address. MAC/IP/Port filter;Content filter;System safety management; Port Forwarding /DMZ. QOS manager;system logs;import and export configuration files; Web software upgrading. 10% -90% RH non-condensation; Storage temperature. 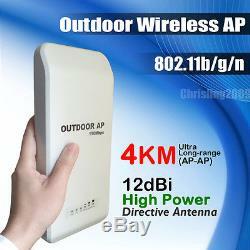 1pcs High Power Outdoor Wireless 802.11b/g/n 150Mbps AP. 1pcs Europe slot power cable. To Canada, Australia, Indonesia , New Zealand , Singapore. Sometime, it will be delay. Need pass long travel and. Several procedures for the handover, if it have delay, Hope you can. If you need the product hurry, Please. Our company in accordance with the Beijing time schedule. Check it is correct before you. Bubble bag pack(easy package). Or big volume, we will pack them together. 2:If you need retail box pack for per product, please. We can provide the box. Don't return the package to the address in the package , that is. Receive the package on time, or the product have. We will promptly help you solve the problem. Because the time difference, hope you can understand for the delay reply within 24hours. If you are satisfied with our. If you are not satisfied with our. We promise to try our best to. Good communication is always the best way to resolve problem. Let us trust each other. The item "High Power Outdoor Wireless Network AP Access Points Client Bridg 802.11b/gn 11n" is in sale since Wednesday, January 18, 2012. This item is in the category "Computers/Tablets & Networking\Home Networking & Connectivity\Wireless Access Points". The seller is "chrisling2009" and is located in shenzhen. This item can be shipped worldwide.